I remember all too well friends with children telling me how busy life got once their children started school. I thought I would at least have until closer to the end of elementary school before it got so crazy. In reality, Riley has started kindergarten and between gymnastics, dance, PTA meetings and room mom meetings, every night of the week is crazy. Consequently, I rely on quick and easy meals like this one. 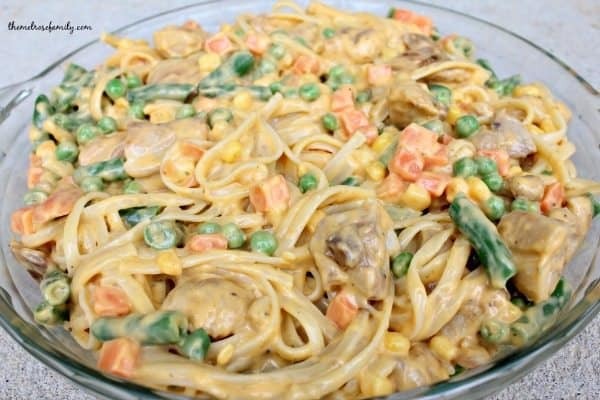 This is the Easiest Chicken Noodle Casserole EVER. The busiest days for us are Mondays. Avery has gymnastics mid morning while Riley is at school. We come home, eat lunch and then it’s time for a nap for Avery and a solid two hours of work for me. Once Avery gets up we go to pick Riley up from school to get her to dance on time. After dance I have about an hour to get a meal cooked and the girls fed so that I can get back to Riley’s school for a parent meeting. It’s a complete whirlwind. Luckily, Campbell’s new products make it so easy to get a comforting family recipe on the table. 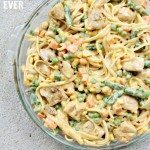 This is honestly the easiest Chicken Noodle Casserole EVER. 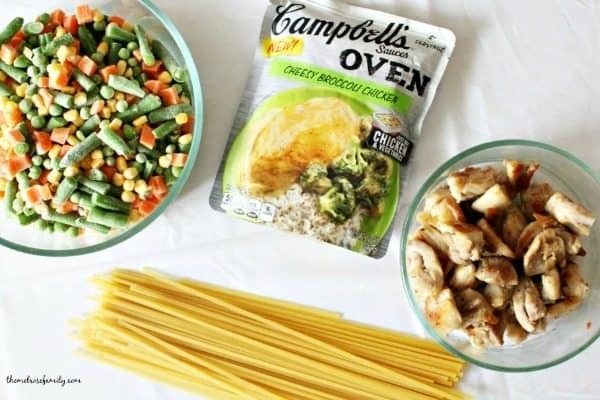 The meal consists of four ingredients frozen vegetables, cooked chicken, fetuccinne pasta and @Campbells Cheesy Broccoli Chicken Oven Sauce. That’s it! Not only did my girls love this recipe, but my husband was a fan as well. It’s always a keeper when my husband goes back for seconds. Campbell’s new products make it so easy to make a meal that my family loves and you can find more delicious Campbell’s recipes to inspire your busy weeknight meal. Campbell’s Sauces comes in varieties for Slow Cooker, Skillet, Oven and Grill Sauces. It’s dinner in 3 easy steps! 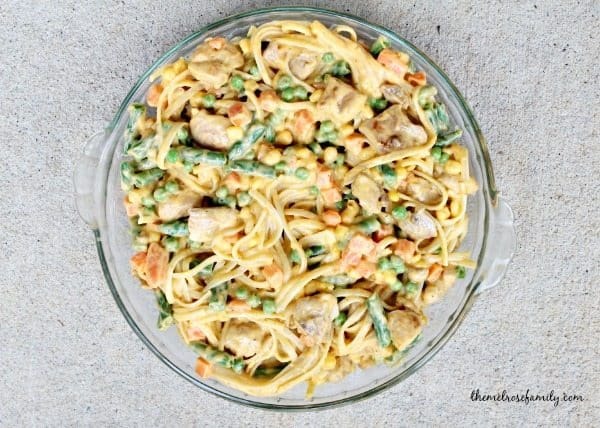 This Chicken Noodle Casserole is the easiest weeknight meal ever. Cook the fettuccine pasta according to package directions. Preheat the oven to 350 F.
In a large mixing bowl combine the cooked chicken, frozen vegetables, oven sauce and cooked pasta. Place the mixture into a casserole dish and back for 30 minutes. 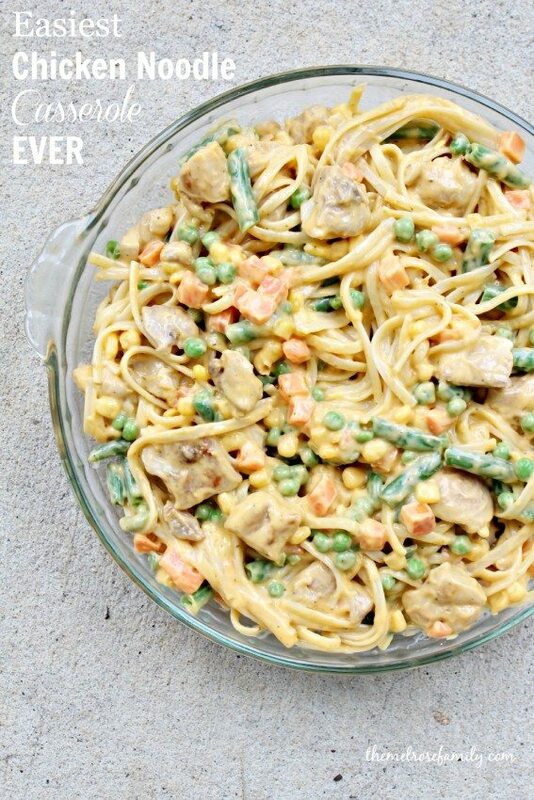 This sounds delicious- I love having a casserole for dinner after a long (chilly) day of work! I found this on Whimsy Wednesday.